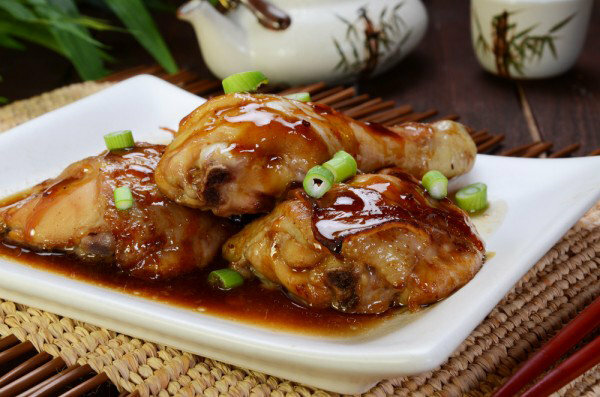 The sauce is made from just five ingredients, including Hoisin sauce, garlic, soy sauce, cayenne pepper, and rice wine. Only 220 calories per serving. In a large bowl, mix together all of the ingredients besides the chicken thighs and green scallions. Once the sauce is fully mixed, add the chicken pieces and fully coat with the sauce on all sides. Place chicken in a baking dish that has been thinly coated with cooking spray or olive oil. Cook for 20- 25 minutes, uncovered, or until the internal temperature of the chicken reaches 165 degrees F when taking with a meat thermometer (or until chicken is cooked through). Remove the baking dish from the oven and allow the chicken to rest, 10 minutes, covered before serving. Serve garnished with green scallions. Serve suggestions include serving with steamed rice or quinoa and a vegetable.